South Africa 208 (AB de Villiers 95*, Farhaan Behardien 35, Mohammad Irfan 2-38) beat Pakistan 205 (Kamran Akmal 48, Younis Khan 29, Ryan McLaren 3-32) by six wickets. The Green Shirts managed 205 runs before they were bowled out with five balls to spare and the Proteas smashed 208 for the loss of just four wickets in 44 overs. AB de Villiers (South Africa) was declared ‘Player of the match’ for his adventurous unbeaten 95 runs and also earned the honour of ‘Player of the series’. He was the highest run scorer from either side by hammering 367 runs at an awesome average of 91.75 with the best of 128 comprising one hundred and three fifties. The fifth and final One Day International of the series was played on Sunday, March 24, 2013, at Willowmoore Park, Benoni. Earlier, Misbah-ul-Haq, the captain of Pakistan, won the toss and opted to go into batting first. Mohammad Hafeez was gone for just five runs, Kamran Akmal replaced him and added 20 runs with the other opener, Imran Farhat, who scored just 13. The most experienced batsman of the visitors, Younis Khan, came in next as Kamran Akmal kept on playing his shots at his end. Younis Khan hit the first four of his innings in the 16th over and completed his 7000 runs in the limited overs cricket on the second ball of the next over. The third wicket partnership enhanced the score to 97 in 23.4 overs when Kamran Akmal was caught by McLaren at backward square leg off Robin Peterson for 48 from 51 balls with 1 six and 6 fours. Younis Khan followed him next after the addition of seven runs to the total at his personal score of 29. Misbah-ul-Haq and Shoaib Malik shared an association of 47 and lost their wickets for 24 and 28 runs respectively. The lower order batting was thrown out cheaply by the rival bowlers, except Junaid Khan who scored 25 as the innings of Pakistan was folded back for 205 runs in 49.1 overs. Ryan McLaren was the chief wicket taker with three, Morne Morkel held two whereas Dale Steyn, Lonwabo Tsotsobe, Robin Peterson and Farhaan Behardien shared one wicket each. The Proteas lost their first wicket for 12 runs when Colin Ingram got together with Hashim Amla as the first hit 2 fours in the 9th over. Ingram did not stay longer and was clean bowled by Mohammad Hafeez for 15 runs. AB de Villiers walked in next in a difficult situation and got a lucky break when Younis Khan dropped his regulation catch in the slip off Junaid Khan at just one run. That was a huge blow for the visitors as de Villiers never looked back from there and kept on crawling with Amla who became the next victim at 83 in 22.4 overs for 22 runs. 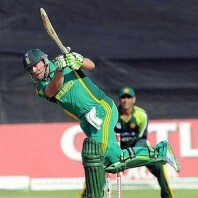 Farhaan Behardien was the new batsman in as de Villiers attained his 32nd ODI fifty in the 26th over. Misbah-ul-Haq utilised six bowlers to separate the partnership but remained unsuccessful whereas the batsmen were getting closer to the target. 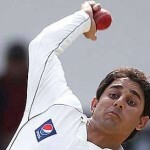 Behardien was given out at 31 by the field umpire but his decision was overturned by the third umpire after the review. The willow of AB de Villiers was showering boundaries and he added another two in the 37th over as Behardien was caught at fine leg by Saeed Ajmal off Mohammad Irfan for 35. David Miller walked in next and remained calm until the 42nd over but hit 1 six and 1 four in the next over. AB de Villiers dispatched the winning four on the last ball of the 44th over as the hosts powered 208 runs with 24 balls to spare. 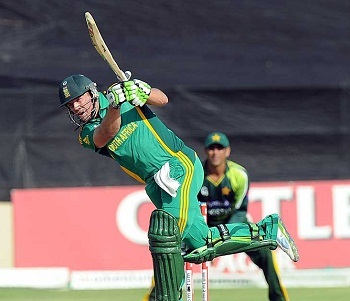 AB de Villiers stood firm at 95 off 111 balls with 1 six and 9 fours and David Miller secured his end with 20 runs. 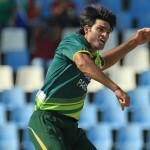 Mohammad Irfan impressed by taking two wickets whereas Junaid Khan and Mohammad Hafeez claimed one wicket each. 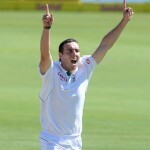 South Africa won the fifth ODI in a commanding way by a huge margin of six wickets and clinched the series 3-2.